Senior Trump administration officials said all 60 Russians were spies working in the U.S. under diplomatic cover, including a dozen at Russia's mission to the United Nations. The officials said the administration was taking the action to send a message to Russia's leaders about the "unacceptably high" number of Russian intelligence operatives in the U.S.
"Today President Donald J. Trump ordered the expulsion of dozens of Russian intelligence officers from the United States and the closure of the Russian consulate in Seattle due to its proximity to one of our submarine bases and Boeing. 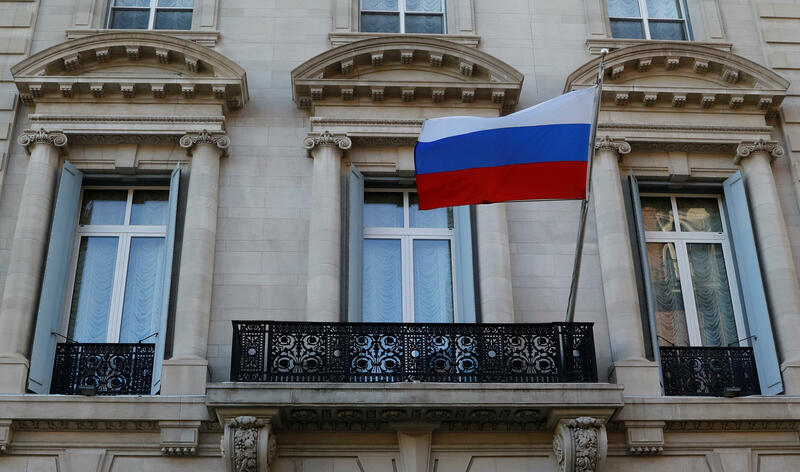 The United States takes this action in conjunction with our NATO allies and partners around the world in response to Russia's use of a military-grade chemical weapon on the soil of the United Kingdom, the latest in its ongoing pattern of destabilizing activities around the world. Today's actions make the United States safer by reducing Russia's ability to spy on Americans and to conduct covert operations that threaten America's national security. With these steps, the United States and our allies and partners make clear to Russia that its actions have consequences. The United States stands ready to cooperate to build a better relationship with Russia, but this can only happen with a change in the Russian government's behavior." Shortly after the announcement, State Department Spokesperson Heather Nauert said in a statement on that "The United States calls on Russia to accept responsibility for its actions and to demonstrate to the world that it is capable of living up to its international commitments and responsibilities as a member of the UN Security Council to uphold international peace and security." Nauert added of the punishment for Russia's "destabilizing behavior" that the U.S. "takes these actions to demonstrate our unbreakable solidarity with the United Kingdom, and to impose serious consequences on Russia for its continued violations of international norms." Meanwhile, Mr. Trump's top U.N. diplomat Nikki Haley sent a statement saying that twelve intelligence operatives from the Russian Mission to the United Nations have abused their privilege of residence in the United States, CBS News' Pamela Falk reports. "Here in New York, Russia uses the United Nations as a safe haven for dangerous activities within our own borders, " Ambassador Haley said. The move was one of the most significant actions Mr. Trump's administration has taken to date to push back on Moscow and Russian President Vladimir Putin. Less than a week ago, Mr. Trump congratulated Putin by phone for his re-election but didn't raise the spy case, renewing questions about whether the U.S. president is too soft on the Kremlin. The Russians preemptively responded to threats of the expected expulsion through a series of social media messages. Russia's Embassy in the United States tweeted late Sunday night, "Strategic stability of the entire world depends on Russia-US relations. They should not be taken hostage by clearly staged stories." The embassy added that the Trump administration still had "time" to change their minds on following through with such actions, which they said would "prevent negative aftermath of this fake story from happening for the sake of all little positivity left in the Russian-American relations." The embassy then issued a follow-up tweet after the president's order -- appearing to suggest a retaliatory closure of a U.S. consulate in Russia, and asking for the public's help in choosing which one. The U.S. actions came as more than a dozen nations, including those in Russia's neighborhood, were expected to announce similar steps to reduce Russia's diplomatic presence in their countries or other actions to punish Moscow. Poland summoned Russia's ambassador for talks, and its foreign ministry was among several in Europe planning news conferences later Monday. Tusk tweeted Monday in response that 14 EU Members States had decided to also expel Russian diplomats. "Additional measures including further expulsions are not excluded in coming days, weeks," he added. Britain has accused Moscow of perpetrating the attack. The U.S., France and Germany have agreed it's highly likely that's the case.